Run on a Dynamics 365 portal: With this option, the Marketing app works together with the Dynamics 365 portals solution to provide fully automated publishing and hosting of marketing pages and the event website. You can provide all of these features without changing, or even owning, your own website. However, it requires a portals license and the features aren't fully native on your organization's website. Run on your own website or CMS system: with this option, you host the interactive marketing features on your own website. This method enables you to integrate the features into your own website structure and to match your site design perfectly. It also lets you provide these features without requiring a Dynamics 365 portals license. However, it does require you to implement these features manually and to maintain your own website. You can also run with a mix of both of these techniques or switch between them if needed. The portals solution is highly flexible and customizable. You can create portals for a wide variety of purposes (such as self-service, registration, and data management) and audiences (including customers, partners, and employees). If all you need are the standard marketing page and event website features provided by Dynamics 365 for Marketing, then, you never actually have to access the portal capabilities directly because Dynamics 365 for Marketing creates, configures, and manages these portals automatically. However, you can also use the portals solution to create custom portals and websites that include features that interact directly with Dynamics 365 for Customer Engagement data. If you want to integrate with a Dynamics 365 portal (optional), then an unconfigured portal app must be available on your tenant when you install Dynamics 365 for Marketing. Depending on the licensing plan you have chosen, your license may include a free portal (provided no other free portals are already in use on your tenant), or you may need to purchase a portal license before you can set up the integration. More information: Why do I need a portal, and how can I get one? The portals solution is included with the Marketing app and is available as an add-on for many other Dynamics 365 applications. For complete details about how to work with the portals solution, see its online help. Behind the scenes, each marketing page is created as a portal website that is hosted under the portal capabilities for Dynamics 365 solution. However, you won't find them listed anywhere in the portals area of the custom app. Instead you'll set them up by using the Marketing Pages, Marketing Forms, and Marketing Form Field entities in the Marketing work area. More information: Create and deploy marketing pages. The event website is a self-contained web application developed using the Angular framework. You can host the event website on your own webserver or on a Dynamics 365 portal. If you installed Dynamics 365 for Marketing with portal integration enabled, then the event website was installed there automatically. For general information about how to work with the event website, including when it's hosted on a portal, see Set up the event website. 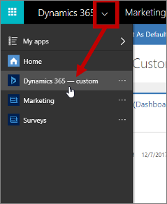 Go to the custom app by selecting Dynamics 365 - custom from the app-selector menu. The custom app provides a horizontal navigator at the top of the page. Use it to open the Portals tile and then work with the entries there. For complete details about how to work with the portals solution, see its online help. Event website: The event website is a self-contained web application developed using the Angular framework. For instructions about how to download, customize, and install it on your own website, see Build and host a custom event portal. You can also run this same exact project on a Dynamics 365 portal if you prefer.